John Constantine comes to Arrow. The much hyped crossover finally arrives as Oliver calls in help from an old friend to help with Sara’s troubled resurrection. This episode really does cram a lot into it and it is perhaps a little too much for one story but it does make a few important leaps forward. Sara is no longer soulless, Diggle finds out some information about his brother that he doesn’t feel comfortable knowing and Ray Palmer is finally established as being alive. Sara’s story takes on the main focus of the episode after her escape last week. She is running around town killing criminals and going after people who look vaguely like Thea. The reasons for that are unclear but Thea attributes it to an uncontrollable rage against the person who caused the death in the first place. Thea says that whenever she thinks about Ra’s Al Ghul she feels that kind of anger so since Thea was the one to kill Sara it would stand to reason that Sara would want revenge on her. It is only a theory that appears to be backed up by what Thea has experienced and it works as a motivation for the soulless Sara to seek her out. It also keeps her close to Team Arrow in a way that feels organic for them to keep running into her. Poor Caity Lotz has the thankless chore of doing a lot of grunting as she viciously attacks people. There is nothing of Sara’s character in this episode despite the significant showing that she has. The coming episodes will undoubtedly deal with how she copes with being back from the dead and hopefully some kind of insight into what it was like for her to be dead. The news of Sara’s resurrection reaching Oliver provided an excellent opportunity to show how different he is this season. In previous seasons Oliver would have been quick to anger and chewed Laurel and Thea out for playing a part in this. Instead he remains calm and looks more disappointed. Laurel has meddled with forces that she doesn’t understand and didn’t even think to trust Oliver with her plan. He would absolutely have done everything to prevent her from doing so and with good reason but it doesn’t alter the fact that people going around behind his back really irritates him. It creates an interesting conflict with Laurel where she points out to him that he has never seen her as an equal when she has given him everything. He hid his identity as the Arrow from her and didn’t mention taking Thea to Nanda Parbat. She points out the hypocrisy involved in judging her for resurrecting her sister when Oliver did the same for his. There’s a real naivety to Laurel’s points as Oliver only took Thea to Nanda Parbat because he was going to accept Ra’s Al Ghul’s offer to replace him in order to put a stop to him trying to destroy his life. Thea was the deciding factor because she was killed over something that he was refusing to do so Laurel making that comparison is very flawed. I can see where she’s coming from on an emotional level but there’s no comparison between the two events. This is a difficult situation for Quentin who is trying to hunt down his own daughter while keeping it hidden that she is the one that he is looking for. He leaves it to Team Arrow to take care of but he has to present the appearance of doing something since people are being killed over it. It has been an emotionally difficult time for Quentin of late and it’s only going to get worse. His status as a mole for Oliver in Damien Darhk’s organisation hasn’t been compromised yet but the plot thickens when he is asked to break into a server farm and implant a virus that will erase some information. He takes Diggle with him and installs the virus only to find out that it’s erasing information about people in the military. Diggle’s brother is among them which gives Diggle a personal stake in all of this. There’s a great scene where Diggle and Quentin talk about his involvement with the organisation that killed his brother. It’s a very mature conversation where they lay the cards on the table and identify that they won’t have a problem as Diggle believes that Quentin’s intentions are pure. I really like seeing them share scenes together and would like it to happen more often. Diggle finding out that his brother was involved in some really shady business should give this character plenty to deal with over the season. Damien Darhk is again seen as scarily intelligent and insightful when Quentin asks him about Diggle’s brother. He is very suspicious of that specific name being mentioned and wonders what the connection is. It’s only a matter of time before Darhk finds out either about Diggle’s involvement with Team Arrow or Quentin’s involvement with Diggle. Either way it won’t be good for them when it happens. Felicity and Curtis are still on the fringes of the series with another small step forward in the inevitable return of Ray Palmer. It is established that Curtis is an Olympic level athlete and competed in the Beijing Olympics which pretty much solidifies his development into Mr. Terrific at some point. As fun as these scenes are I feel like it has taken too long to establish this information about Curtis and it has certainly taken too long to reveal that Ray is definitely alive. Hopefully now that it’s out of the way things can progress a lot faster. Now onto the big guest star. Matt Ryan reprises his role as John Constantine after his short lived TV show was cancelled. Readers of this site will know that I was a fan of that show while it lasted and if you’re interested then all my my reviews of it can be found here. I don’t think there are many people who would disagree with the objective fact that Matt Ryan is just about as perfect a live action John Constantine as it gets so it’s a shame to have the show cancelled when it had so much promise. Having him return on Arrow feels like something that really shouldn’t happen but it has and the episode is better for it. John’s first appearance in the episode is in the flashbacks. It turns out that he is on the island chasing after some mystical artefact and gets caught while he’s there. He manages to engineer his escape and takes Oliver on his quest. This allows for plenty of time for great banter between the two characters and quickly establishes John as someone who is very resourceful, witty and knows a lot about magic. Matt Ryan doesn’t miss a beat stepping back into the trench coat as if he never left it and reminds audiences why he is the perfect choice for this role. 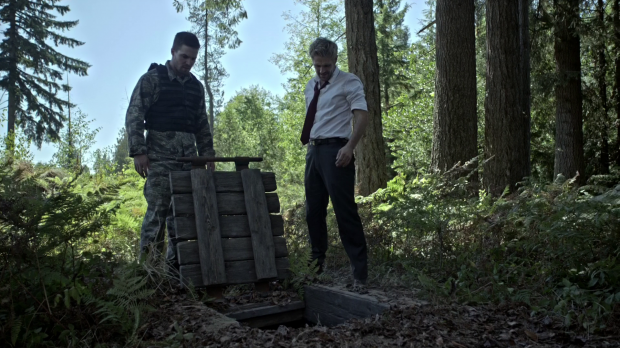 Stephen Amell and Matt Ryan are great in their scenes together. They bounce off each other brilliantly and John feels like a natural fit on the show. Things like this are why these sorts of crossovers are always a lot of fun. If only they’ll make up their mind about Supergirl in relation to these shows. 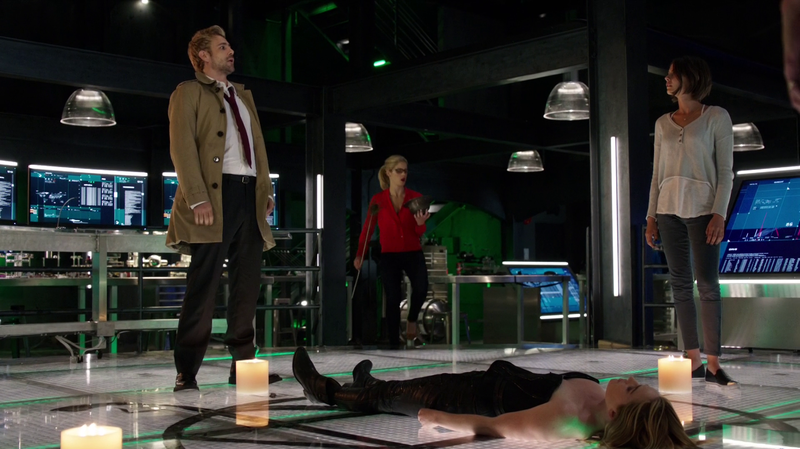 Constantine links the flashbacks to the present day in the most effective way this season. It establishes Oliver’s prior encounter with him and makes it clear why Oliver is drawing on that experience at this particular point. Having Constantine in the flashbacks allows him to be in more scenes without him feeling like he’s hanging around in the present day unnecessarily. This episode gave as much of Constantine as it needed to but not as much as I wanted it to. That is entirely a personal hangup of mine as I really want to see more of that character but I think the way he is used here is better than having him being in scenes just to have him there. He is brought in when Sara is captured and her soul needs to be restored. Having him in before that makes no real sense so that is why he’s there. The reality of the situation is that it didn’t need to be him specifically as any magically inclined character would do but at the same time it doesn’t hurt to have him around given his popularity and the needs of the story. I also feel compelled to mention the joke at the expense of John’s former home on NBC. I love the way he fits into Team Arrow and casually flirts with all the women around him. He puts his expertise to good use and transports Laurel, Oliver and himself to another realm to go after Sara’s show. 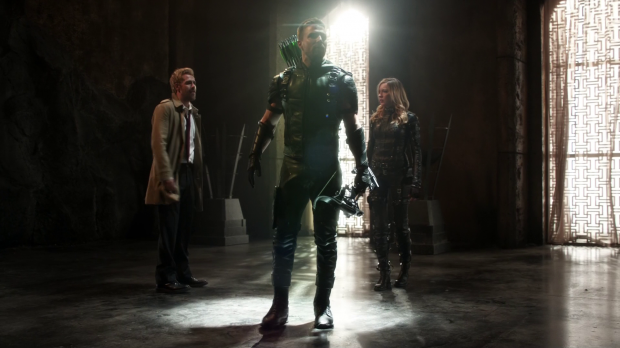 This sequence was a bit bland looking but it does represent the fact that Arrow can’t turn back now. It has fully committed to outlandish mystical elements so has moved on from being the gritty superhero show it once claimed to be. It’s a good fit and I like that the show is continually evolving. It looks far too easy to reclaim Sara’s soul as it boils down to a few guys with swords who seem easily dispatched. There could have been an attempt to do something really interesting here and present something mystical and weird but this works reasonably well for the purpose. The final exchange between Oliver and John is really good as well. Oliver’s words leave it about as open as it can be for him to return and I hope that he will because seeing the character again has only wanted to make me see more of him. Constantine’s warning about Darhk carries a lot of weight due to his mystical experience so I’m hopeful that Oliver will need his help to bring him down. A guy can dream can’t he? A really good episode that gives fan favourite John Constantine one more chance to entertain audiences in his own madcap way. There’s a lot going on here but Sara takes the main focus as she is going after women who look like Thea which leads Thea to theorise that being brought back by the pit makes your bloodlust against the person that killed you uncontrollable. It’s only a theory but certainly seems to stack up. Poor Caity Lotz had to do a lot of running around and grunting for this episode. Oliver’s reaction to Sara’s resurrection really shows how far he has come since season 1. Instead of getting angry he acts more disappointed that Laurel meddled with forces she didn’t understand and wouldn’t come to him for help. Laurel calls him out on being a hypocrite as nobody judged him for doing the same for his sister. It makes sense from an emotional point of view but her reasoning is flawed as these are two completely different situations. Quentin and Diggle make for a solid team and I like that they had an adult discussion that got all of the cards on the table before a problem could present itself. I hope that these characters do more together as it was very enjoyable here. Diggle finding out that his brother was involved in some shady business is a blow for him and should give him lots of opportunity to develop as the episodes progress. Felicity and Curtis are still moving on with their own story that now establishes that Ray Palmer is alive. This has taken a long time to put across so I hope that things will move quite a bit quicker now that this has been revealed. John Constantine is a welcome presence both in the episode and on the show as a whole. Matt Ryan falls right back into his character without missing a beat and fits right into the dynamics at play here. Introducing him in the flashbacks was smart as it allows him to be in more scenes without feeling unnecessary in the present day and establishes how he and Oliver know each other before now. Stephen Amell and Matt Ryan are great in their scenes together. They bounce off each other really well and the dialogue is a lot of fun. The episode supplies as much John Constantine as it needs to but not as much as I would have wanted. This is a personal hangup of mine because I want to see more of the character but he was always useful when he was around. Oliver calls him in when Sara has been captured and needs her soul brought back so it makes no sense to have him around before that. It could have been any magically inclined character that was brought in to help but it’s great that they managed to bring John Constantine in. I found the scene where Oliver, Laurel and Constantine are transported to another plane of existence to retrieve Sara’s soul a little bland looking. It was fine but it could have been more ambitious and it felt too easy to accomplish. 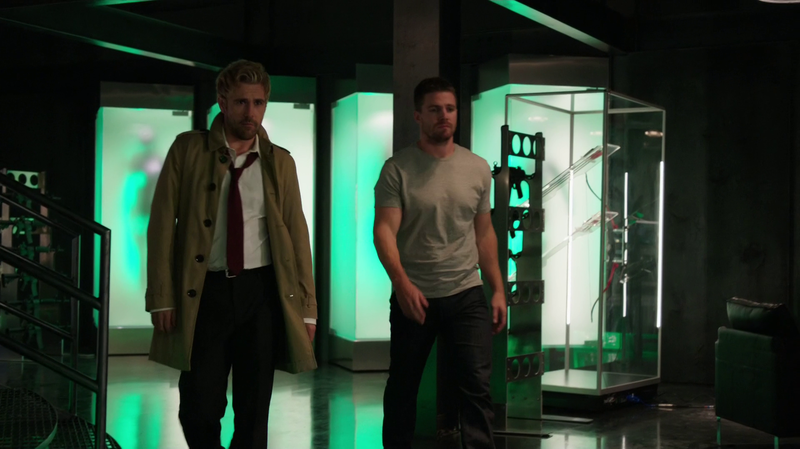 Oliver and Constantine’s final exchange leaves things about as open as they could be for his return and his warning about Damien Darhk helps further establish how much of a threat he is. Hopefully Oliver will bring him back to help take him down.